Feline Kitten provides all the energy and essential nutrients needed to promote proper, healthy growth and development in kittens and is also suitable for pregnant or nursing cats. With the addition of the Superior Anitoxidant Formula, its the perfect foundation for overall health. Science Plan* Kitten has been developed to meet the higher energy and nutrients needs of kittens up to 12 months and of pregnant and nursing cats. 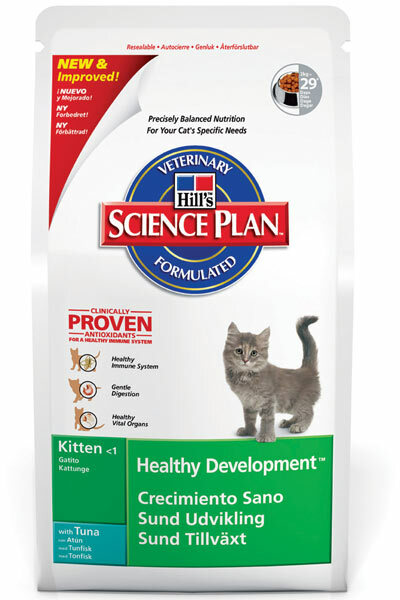 Science Plan Kitten has balanced nutrition and great taste for kittens and pregnant or nursing cats. Science Plan Kitten dry has Hill's Superior Antioxidant Formula to help support the immune system. Promotes healthy skin and shiny coat. Contains Taurine to help maintain normal heart function, retinal structure and reproduction and development. High digestibility reduces stool volume for less litter tray mess and lower feeding cost.